(CNSNews.com) – Israeli Prime Minister Binyamin Netanyahu thanked the Trump administration Wednesday for its decision to bar admission to anyone involved in an International Criminal Court probe into alleged U.S. abuses in Afghanistan. Israel and others share U.S. concerns that “this court has lost its way,” he said. 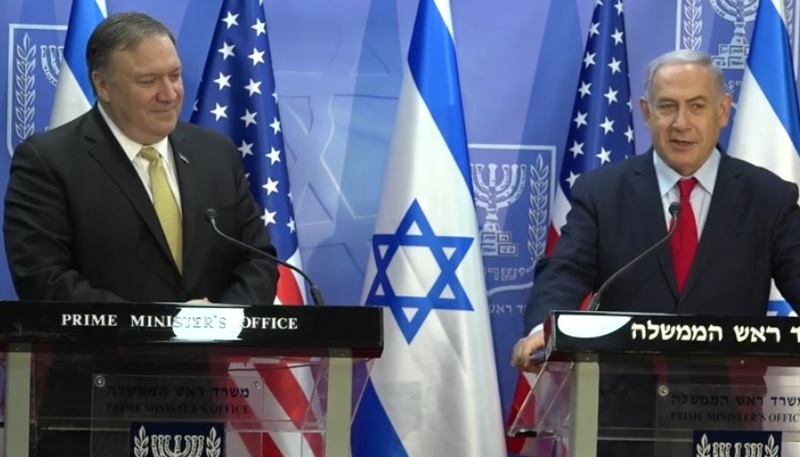 “Instead of dealing with mass atrocities, the court engages in unwarranted and politicized efforts to target the states that are committed to the rule of law and that have not joined the court,” Netanyahu said during a joint appearance in Jerusalem with Secretary of State Mike Pompeo. Neither the U.S. nor Israel ratified the ICC’s founding Rome Statute, which was adopted in 1998 and came into effect in 2002. Washington’s key concern was that troops stationed abroad could find themselves hauled before the tribunal. President Clinton signed the treaty, but chose not to seek Senate advice and consent. The George W. Bush administration then signed more than 100 agreements with nations undertaking not to surrender U.S. citizens to the ICC without U.S. consent. Israel, although an early proponent of the initiative, walked away over the decision to classify Jewish settlement on disputed territory (“the transfer of an occupying power’s population into a territory it occupies”) as a war crime punishable by the court.